The power of the wind has been harnessed for thousands of years. The earliest known use of wind power was the sailboat. As technology has advanced, the wind has been used for grinding grain, pumping water, and providing electricity to farms beyond the reach of power lines. Today, wind farms use the energy contained in prevailing winds to generate electricity for homes and businesses. 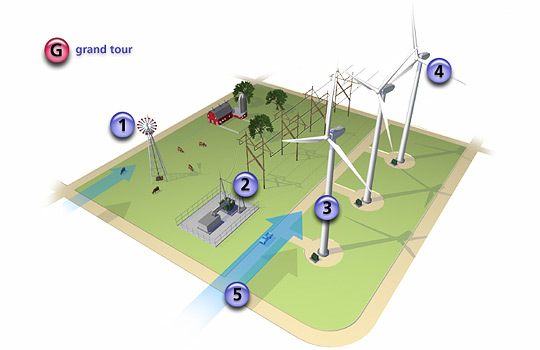 From the history of wind energy to learning how a wind turbine is controlled. Start your tour by selecting any of the numbered icons to view specific operations and examine each phase at your own pace. Select Grand Tour to view the tour start to finish.